There was no power on this morning, for some reason unknown, so when we arose we had to get dressed in the dark. The Elephant Nature Park Law of Wrongful Zips applied – where you open the wrong zip on your many-pocketed bag every time – and it took a while to get the right garment on the right body part. It would have made a lot of sense to open the window to let the light in, but in this case when I say window, I actually mean a piece of wood. There was no glass in the ‘windows’ of our hut, just wooden shutters. And we were pretty reluctant to open those and put on a reverse strip show for all and sundry walking up the driveway. This morning’s glamorous volunteer chore was shoveling elephant pooh from in and around their night shelter. This involved donning gloves and employing a pitchfork each and using carts to shift the pooh over to the large compost heap in another paddock. It’s remarkable how much ‘matter’ is created by thirty-something vegetarians. The general consensus at lunchtime though, was that shoveling pooh is a darn sight easier than corn-cutting, and for the next three days we found ourselves cringing as we gathered each day for the doling out of chores, crossing fingers, toes and everything else that can possibly be crossed against having to get back on the corn truck. I went to the bathroom in our hut to ‘do God’s work’, and when I got up to flush the toilet, I noticed an alarming amount of blood on the floor. 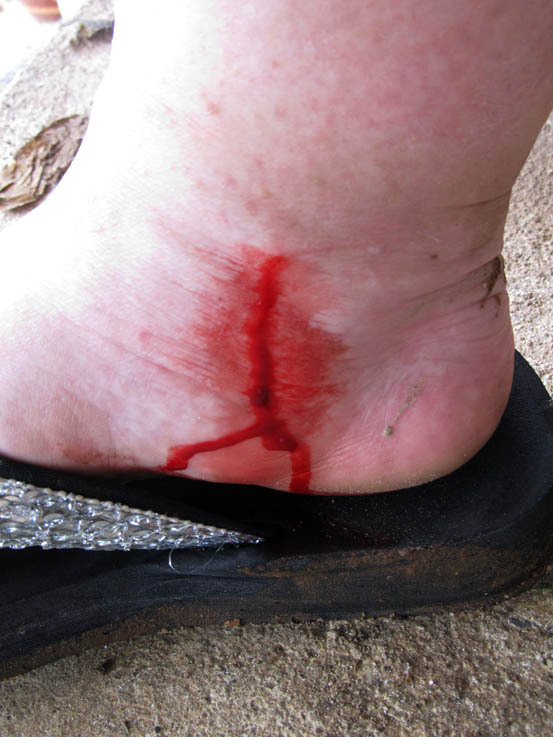 I looked around, wondering if I had stepped on yet another worm, then I noticed that my ankle was bleeding profusely. An inch long black thing was clinging smugly to the side of the toilet, and I realized that I had suffered my first ever leech attack. How exciting! How very exotic!! I got the hose out and sprayed it with the highest pressure possible, and it washed off the toilet, swept across the floor, then grasped onto the grout between the tiling and stayed there, clinging on like a tick on a buffalo. We had to watch where we were walking for the next three days so it didn’t become flattened like our poor little worm guest. For the afternoon, we wandered about the property doing fence-mending and rebuilding. Or, the fine art of many people doing what half a dozen could have done within half the time and just as effectively. ‘Twas a good opportunity to mingle with many other volunteers and have a good chin-wag while we were at it. I also managed to be in on a walk around the park with about five other people with Jodi, to learn more about elephants. As we walked near the two older elephants in the front paddock of the park, Jodi kept a good eye on the herd containing the ratbag Chang Yim, who were gathered by the river several paddocks away from us. Chang Yim was the one who thought it was hilarious to rush towards people and watch them run. It made me pretty nervous, as we only had two antique pachyderms and an old tree to hide behind if anything went down. Plus the grass was quite long, so a swift escape was totally out of the question. And sure enough, after a few minutes I heard an ‘Uh oh’ from Jodi and turned to see Chang Yim scooting towards us with his mahout running madly after him. They may seem slow at times, but I’m sure elephants are part hovercraft. They sort of move their legs a bit and cover a lot of ground in a very short time. In a matter of moments he was getting pretty close and my ‘scared rabbit’ technique kicked in. In other words, I stood still uselessly, hoping that someone had a remote somewhere that would turn that running beastie off! Thankfully his mahout caught up, and between a bit of cajoling, distraction and a whole lot of bribery in the way of food, Chang Yim lost interest in us and wandered off again in another direction. Once again, Jodi amazed me with her ability to talk without coming up for air. She told us about the elephants in the clinic needing rubber mats to cover the concrete and soften things underfoot for them, the boy elephants needing some special land of their own and a special fence to keep them there and out of trouble, the two hundred-plus dogs that were rescued from the 2011 Bangkok floods that the park is caring for, neutering and rehoming one by one, and other animal and elephacts. 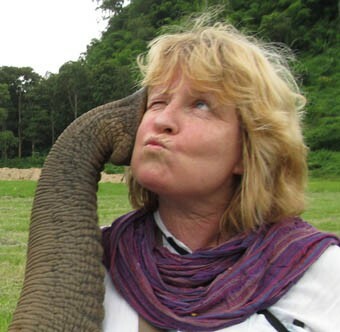 Elephants often buddy up with a ‘BFF’ (Best Friends Forever for us oldies not in the know) and she told us a touching story of an elephant who was unwell and couldn’t lie down. So her BFF stopped lying down too, in a show of empathy. I don’t know about you, but I would find standing up ongoingly to be a heck of a strain after a while, especially with a body that size, so that spoke to me of an enormous loyalty and a significant display of friendship. We walked over to where Jungle Boy was chained up, and Jodi explained that he had to be because he was on the verge of *musth and therefore very dangerous for the duration of that, so they couldn’t let him wander loose in the park. Meanwhile, Jungle Boy swung his huge head to and fro, very annoyed at not being able to go and visit some elegirls and get his frustration out of his system, if you know what I mean. The large chain tethering him looked rather delicate against his enormous ankle, and I had to wonder if part of its effectiveness was psychological. Surely if he really took it into his head to, he could have snapped it and taken off towards his feminine counterparts. And in my mind, I tried to imagine some poor bugger having to convince him to put it on again! 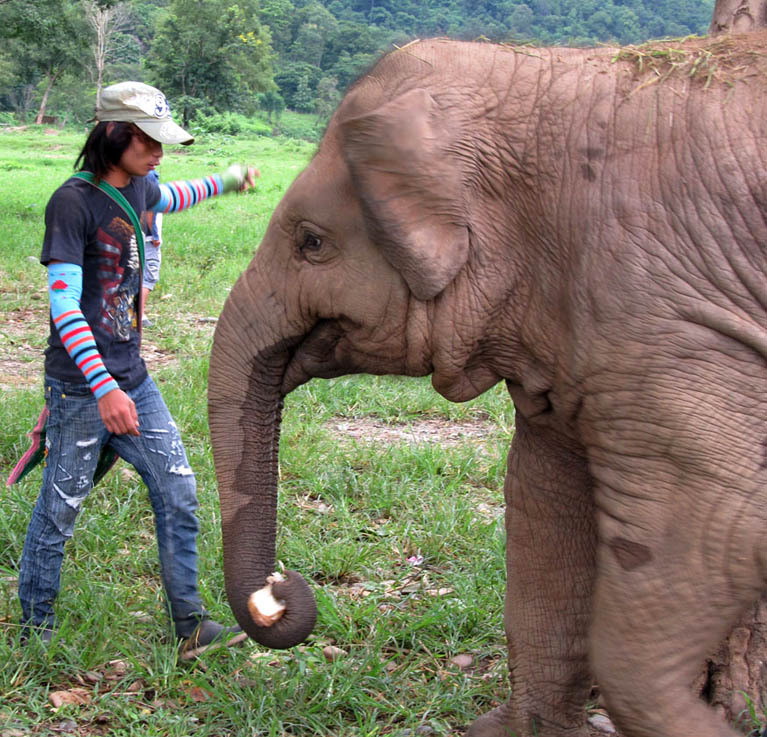 Faa Mai, the beautiful three-year-old darling of the park, came wandering along and had a wee flirt with him. She would go to the food stash, pick a piece up then take it over to show to her big herd brother. He showed enormous interest in her, but as a baby she held very little sexual interest for him, although we could see that she was a welcome distraction. I took a few photos of her shenanigans, including the look on her face when she was shooed away from the food by a mahout. I swear that girl was laughing! After dinner, another round of my ukulele playing was tolerated and a few beers were had, and at 9.30 a whole bunch of us went to sing ‘Happy Birthday’ to one of the volunteers, while one of the camp leaders presented her with a birthday cake he had thoughtfully got made for her in Chiang Mai. Then it was into bed to listen to the elephants slapping grass against their legs and purring to each other and we drifted off to sleep. * Musth or must /ˈmʌst/ is a periodic condition in bull (male) elephants, characterized by highly aggressive behavior and accompanied by a large rise in reproductive hormones – testosterone levels in an elephant in musth can be as much as 60 times greater than in the same elephant at other times. 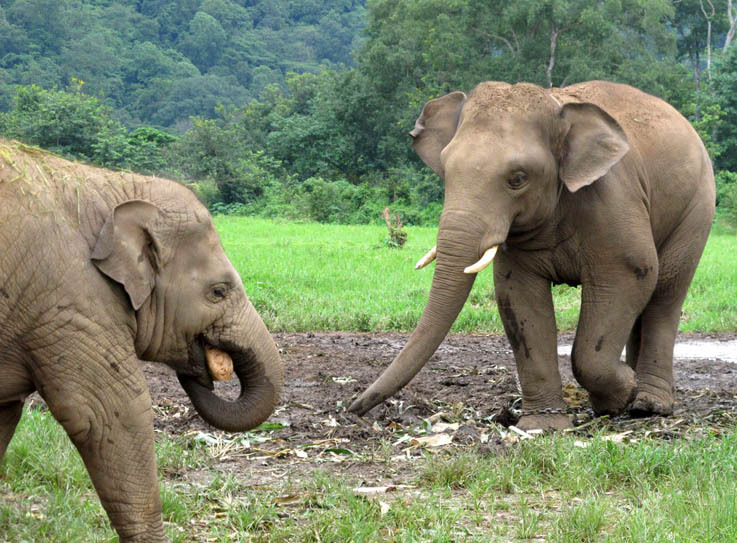 However, whether this hormonal surge is the sole cause of musth, or merely a contributing factor, is unknown; scientific investigation of musth is problematic because even the most placid elephants become highly violent toward humans and other elephants during musth, requiring segregation and isolation until they recover. Female elephants do not undergo musth. This entry was posted in Elephants, Ravings - random wafflings, Ravings on Thailand and tagged Chiang Mai, Elephant Nature Park, Elephants, Leeches, Thailand. Bookmark the permalink. I’ve enjoyed reading about you days at the Elephant Park. Will you be continuing to write about the rest of your adventures during your week of volunteering? Hi Helen. Glad you’ve enjoyed my ravings. I intend to rave more very soon. I have been doing long work shifts away from home and out of touch with the net. But I am back now, and will be smoking up the keyboard shortly. Yes, continue to rave…your descriptions are priceless!! I’ll be there in December for a week and love hearing about your daily adventures. Was there for a day last year…just enough to whet my appetite for more with those majestic creatures.